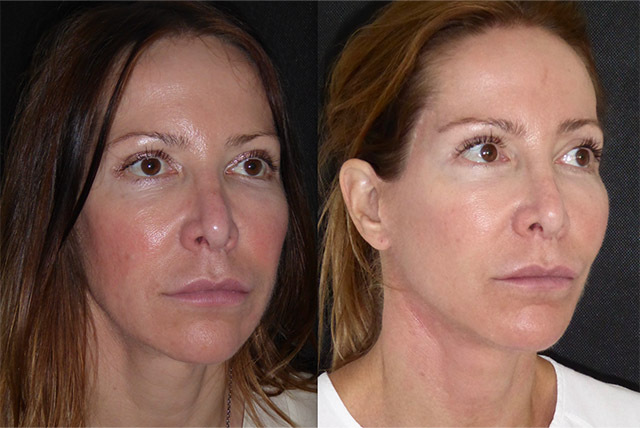 Davina sought my advice to rejuvenate her appearance, particularly her loose neck and under eyelid skin. 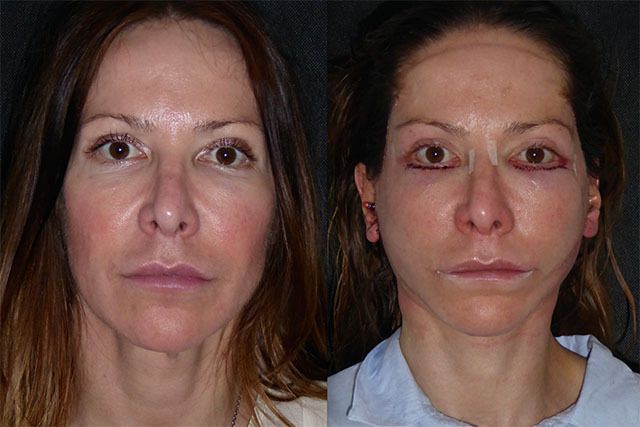 An aesthetically aware, naturally pretty girl it was a big step to consider facial surgery to achieve this. 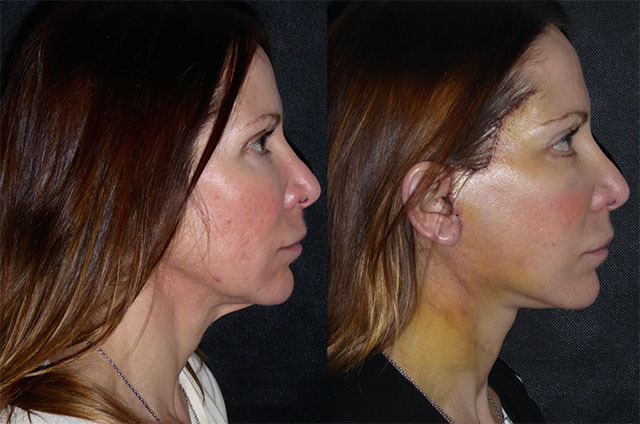 Davina spoke to a few previous patients about surgery and recovery then took the step! 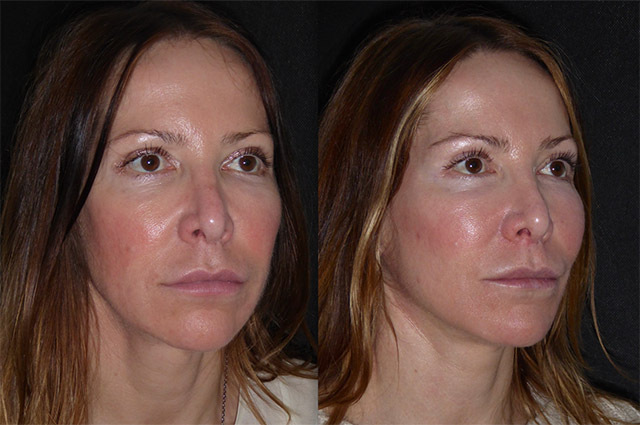 We performed a face and neck lift and lower lid skin pinch to achieve her desired result. Here is the story of her progress. 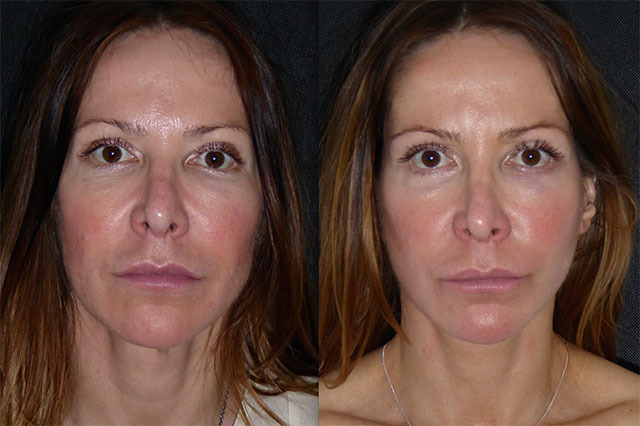 Patients often look fairly alien on day one! 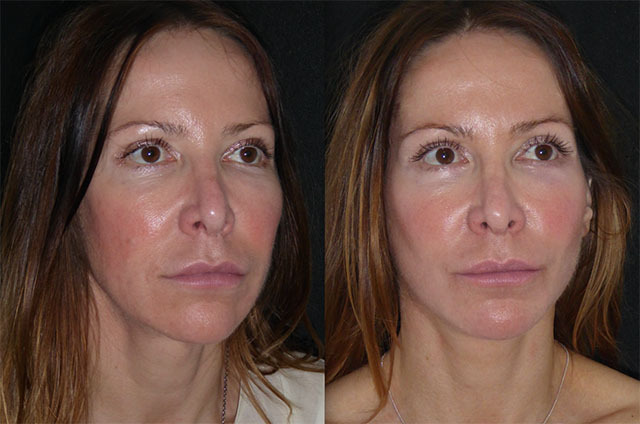 Whilst I am telling them they look great as I can see through the swelling, Patients must think I am mad! I totally understand the trust that my patients have to have in me with their precious face at this stage. Davina is going to have a brilliant result but the day one swelling makes her look a little too pulled, this will settle down into position as healing progresses. 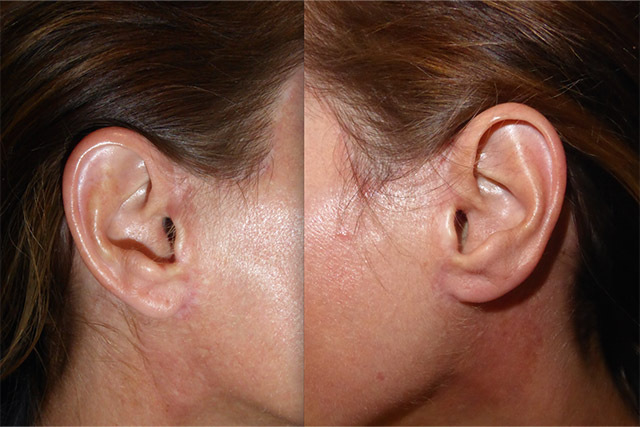 Her previously lax neck skin is improved and the excess lower eyelid skin is removed. Davina’s eyes will look a little rounded and scary ( I describe it like a bassett hound!) whilst the stitches are in but all will normalise once they are out. Just a week (I say just, but for Davina no doubt it felt like forever!) later Davina is looking fantastic. Swelling has reduced significantly and the eyes are normalising after the stitches came out at day 4. 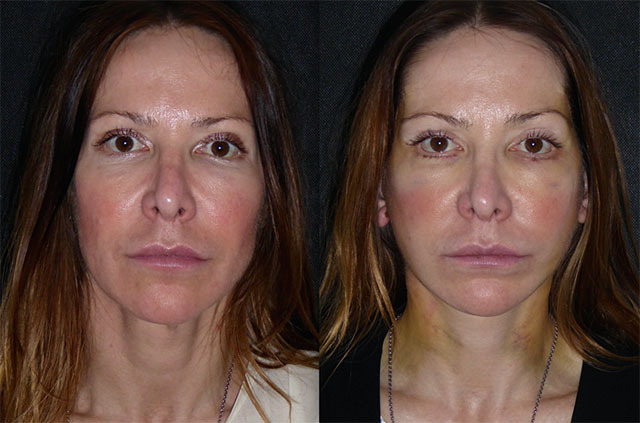 A beautiful face shape is appearing with a lovely defined neckline. All is healing brilliantly. In the next few days I suspect Davina will develop a double chin caused by the remaining swelling descending from the face, but this will subside soon after. Davina is back for review at 10 weeks, a little later than usual but a great chance to see how she is doing with a little more healing time. The answer? Brilliantly! Davina looks so fresh and in proportion. 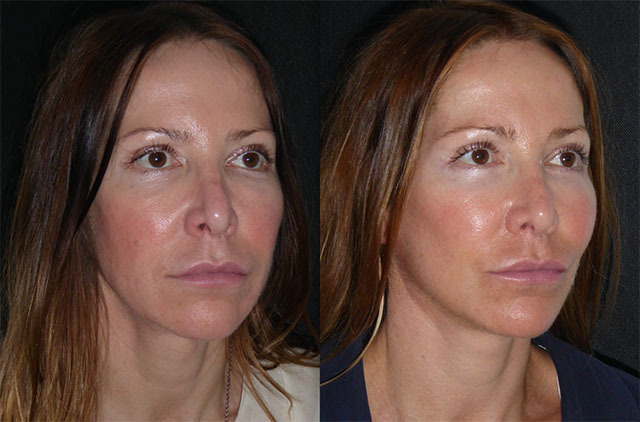 There is restored balance and harmony to her face and her lower eyelid skin looks clean and rejuvenated. 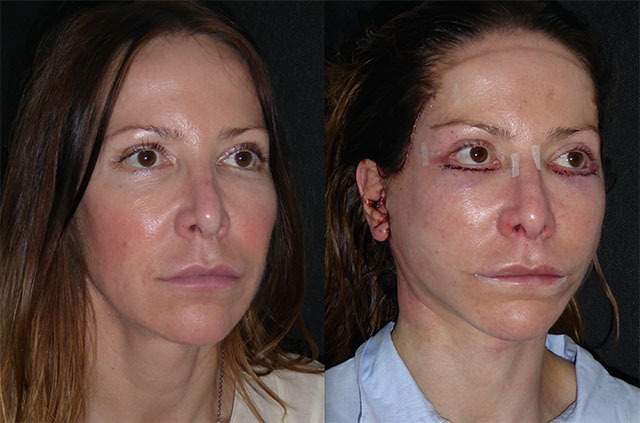 Davina wanted subtle surgery, her natural fear was people seeing that she had had surgery. 10 weeks on she is concerned that nobody has noticed anything. To me this is the perfect outcome. 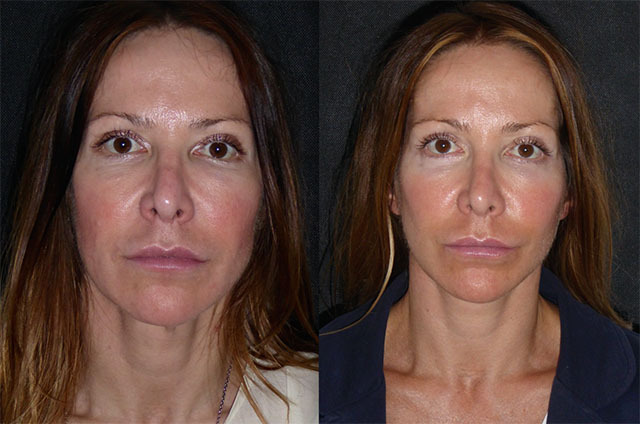 Patients have to look like themselves but better.It is very very easy to make a face look done but this is the antithesis of my goal. It’s one of the reasons I take chronological photos to document the progression. 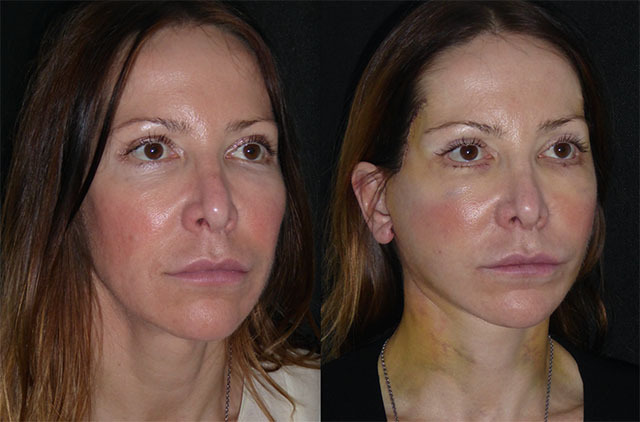 When facelifts are done harmoniously it can be very easy to forget where you started from! Side by side it becomes immediately obvious but to day to day colleagues and friends you just look better. 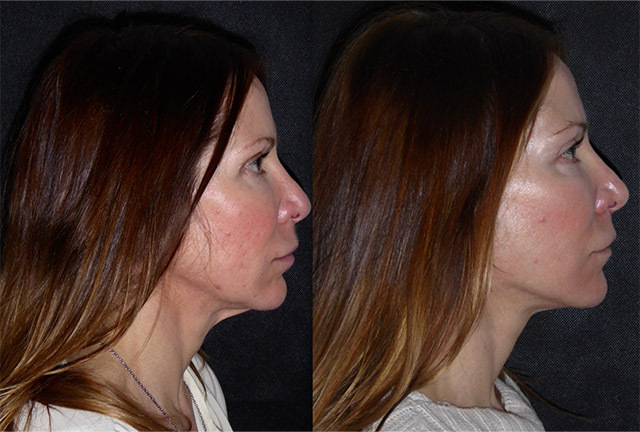 On profile view the eagle eyed will spot that I have balanced Davina’s nasal bridge and tip today with a little filler to restore an attractive profile after previous over exuberant surgery. 6 months out from her Surgery and Davina is looking incredible. 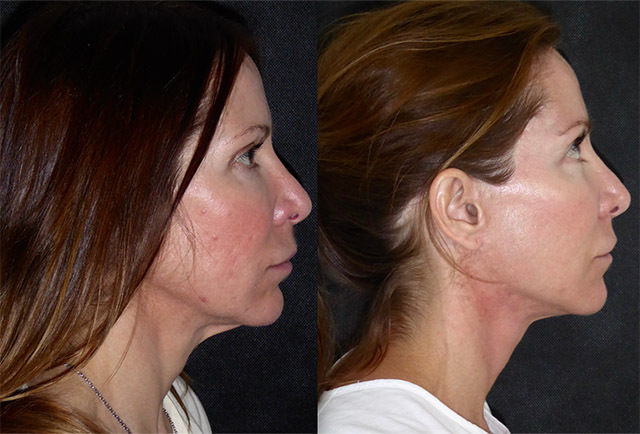 The lax neck skin and tired eyes which brought her to me are gone! 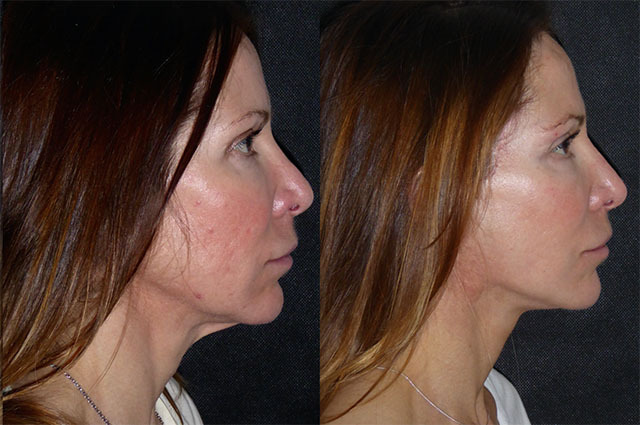 She has healed beautifully and is now facially balanced and proportionate. All scars have healed inconspicuously and she looks just great. 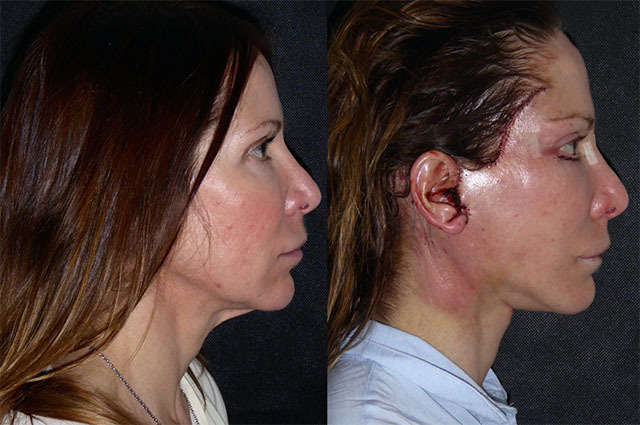 So please she has had such a lovely result. At a year out its lovely to see Davina again. She is back for a little lip filler with Rebecca and I take the opportunity to say hello. I am so pleased I did, Davina looks fantastic and much more age appropriate. 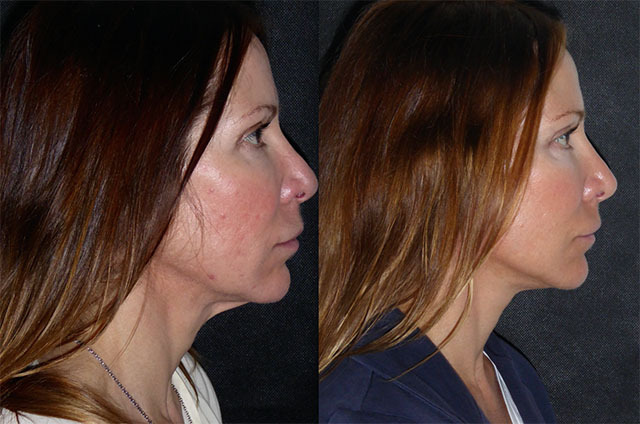 She maintains the mid facial volume despite no additional filler and her jaw and neck lines remain nice and defined. Her eyes look fresher without that lower eyelid skin crepiness. What a lovely result, she has been a pleasure to look after. At almost 2 years out from surgery, its lovely to see Davina again. 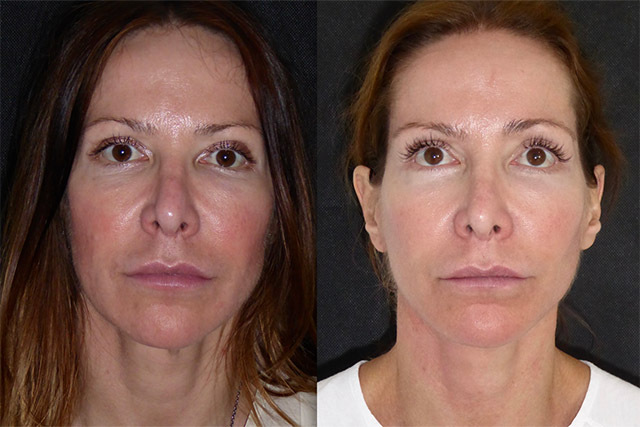 She maintains her new facial proportion particularly in the mid face, this is all volume that used to sit in the lower facial third without the addition of fat or filler. 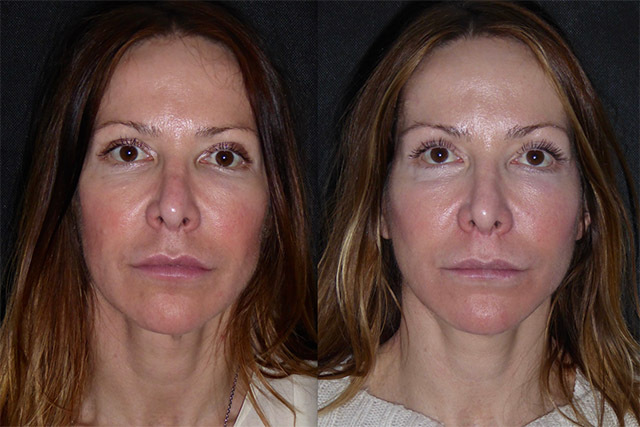 The non surgical rhinoplasty is lasting nicely too!